The Most Delicious Salad You’ll Eat This Year! I don’t like commercial salad dressings for so many reasons! They’re expensive, contain a whole bunch of unrecognizable ingredients and taste like chemicals. 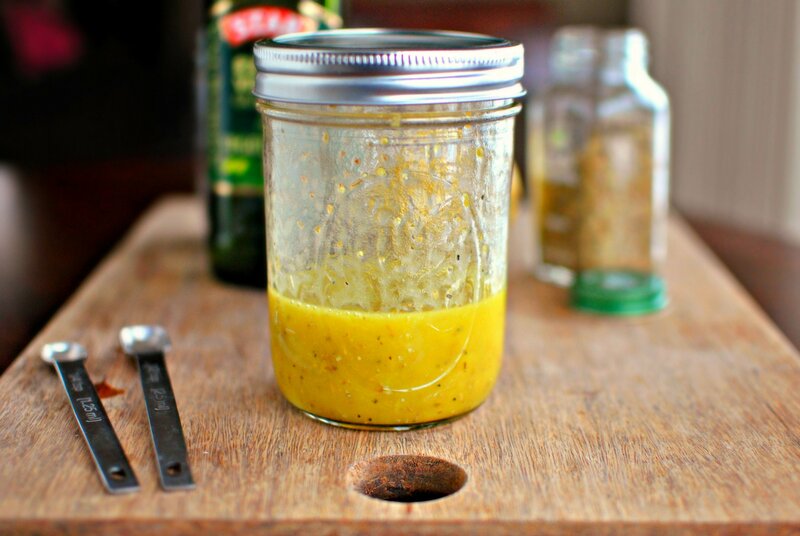 It’s so, so, so easy to make your own dressing by using this homemade salad dressing recipe. I make it all the time when friends or family come over for dinner, or if I have to bring something to a potluck party. Everyone loves it and asks me how I make it. I’ll share my salad making secrets, including the homemade salad dressing recipe with you now! Greens. Forget the iceberg lettuce and make sure you use a nice variety of more interesting (and healthy) things. I usually go for 4-5 types and one of my favourites that I always include is beet greens. It’s even better if you grow your own greens. It’s easier than you might think to have a little garden in your kitchen. Seeds and Nuts. Roast up a whole bunch of interesting seeds and nuts in a dry pan to bring out all the oils and make them extra delicious. I use 4-5 different kinds usually, including things like sunflower or pumpkin seeds, cashews, walnuts or almonds. The best place to get yourself seeds, nuts and other healthy things is on Iherb. They’re an American company that ships around the world really cheaply and they have unbeatable prices. Fruit. I like to add a bit of sweetness to my salad, so I’ll always add some fruit. Some of my favourites ones include Craisins or raisins (Get on Iherb! ), or fresh fruit like strawberries, oranges, mangoes or strawberries. Boiled Eggs. I boil up a couple of eggs, let them cool in the fridge and then slice them up. Fried Mushrooms. I like to fry up 2-3 varieties of mushrooms in salt, fresh-ground pepper, a bit of crushed garlic, and butter. It’s best if you eat them when they’re still warm. Homemade Croutons. It’s super simple to make your own homemade salad croutons. Get some crusty bread, break into small squares, then toss with olive oil/salt/dried basil/oregano/garlic powder. Bake in the oven or toaster oven until crispy. Watch them carefully so they don’t burn! If you use fresh garlic, basil and oregano, be sure to eat it all up within a couple of days. For longer-lasting salad dressing, use garlic powder, and dried basil/oregano. Put all the ingredients into a mason jar, shake it up and adjust to your tastes. You can substitute fresh-squeezed lemon juice for the vinegar if you’d like. You can also use 1/2 canola oil, 1/2 olive oil if you don’t like such a strong taste. Finally, pour dressing liberally over the salad and toss. Eat it all up as soon as possible so it doesn’t wilt. Homemade Salad Dressing is so Easy, Right? Make yourself some delicious salad by following this simple recipe for homemade salad dressing! Your friends and family will be so happy. And, for another secret recipe that I use for potlucks all the time, check out this post: The Most Delicious Hummus Recipe Ever.